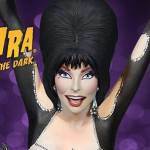 On April 18th, fans will be able to pre-order the latest Elvira Statue coming from Tweeterhead. This one’s not for the kiddies! The upcoming release proved to be a very popular reveal back at San Diego Comic-Con 2016. The Elvira “Vegas or Bust” Maquette is based on her titillating Vegas Showgirl scene in the Elvira: Mistress of the Dark feature film, tassels and all. When famed TV horror hostess Elvira (Cassandra Peterson) quits her job after being sexually harassed by the station’s new owner, she forms a plan to start her own show in the heart of Las Vegas. Upon learning that her great aunt Morgana has passed away, Elvira travels to the town of Falwell to claim her inheritance, only to soon find herself stranded in town when her Macabre Mobile’s engine blows up. Once the stuffy locals get an eyeful of the scream queen’s ample assets, all hell busts loose! Will she become Las Vegas’ next big dance sensation, or will she get burned alive at the stake? The Elvira Statue will be available in standard and Tweeterhead Exclusive editions. The exclusive version will include a hand numbered base that was autographed by Elvira herself, Cassandra Peterson! Read on for a few photos, though they may be considered NSFW by some. Potentially NSFW, unless your boss is cool with tassel twirling be-thonged horror TV icons. All times are GMT -4. The time now is 6:48 PM.